By now you are aware that the Oklahoma City Thunder’s chances of winning or losing any game rest almost entirely on the shoulders of Russell Westbrook—the fact that he’s still averaging 30-10-10 in late January makes his impact on the team perfectly clear—but today is a good day to appreciate just how much work he’s doing when his team needs him most. Game-winners are memorable, and thus count for a lot when fans start talking about who is clutch and who isn’t. But coming through in high-pressure situations is about more than just hitting shots as the clock winds towards zero, and nobody has been better than Westbrook at elevating his play when the game is on the line. NBA.com’s stats page keeps track of players’ performance during clutch time, which is defined as the last five minutes of any game in which the two teams are separated by five points or less. So far this season, Westbrook is near the top of the league in just about every meaningful clutch category. This certainly has to do with the fact that the Thunder don’t really have any options outside of Westbrook late in games. His usage rate in clutch situations is an almost unbelievable 60 percent, and he’s attempting more field goals and threes than any other player in the league in those minutes. But there’s a difference between being a team’s only option in critical moments and being a good option, and Westbrook is proving to be both. The Thunder are 26-19 overall and 15-10 in games that went into the last five minutes with the teams separated by five points or less. A few other teams have better clutch winning percentages—the Cavs, the Spurs, and the Warriors are among them—but those are super teams. All the Thunder have is Russell Westbrook, and he’s giving them everything he has. 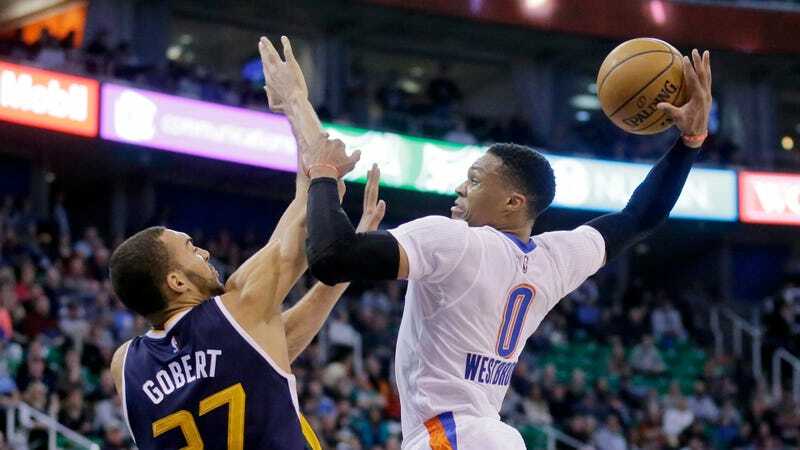 Russell Westbrook On Rebounding Prowess: "I Just Be Chilling There, Act Like I&apos;m Not Doing Nothing"